What do you think of when seeing this boulder? Surely you would have just said seemed like a normal rock, right. But if we doing close examination, the boulder weighing 1.5 tons is far from the usual, you know. 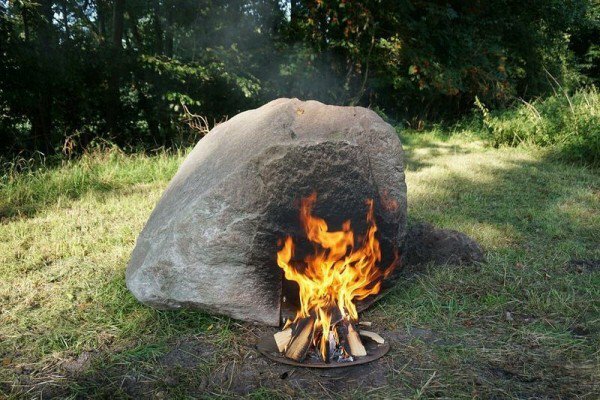 This unique fire boulder in the forest which is also part of an outdoor museum in Germany is an art installation with fire-powered WiFi router and USB drive hidden inside. As quoted of Odditycentral on Tuesday, February 16, 2016, this boulder named 'Keepalive' made by Aram Bartholl was an invention is tried to highlight the contrast between ancient and modern survival techniques. Bartholl explains the inspiration to combine the concept of primitive and modern life comes from the view of people selling the BioLite stove. With no electricity, people correctly use fire stove powered to power their devices to stay connected. "It's funny, when the power goes out then people will buy this little stove and set a fire to charge their cell phones," said Bartholl. Therefore he created a rock that is exclusively focused on the energy produced by the thermoelectric generator that can convert heat into electricity. The visitors at the Springhornhof museum also need to go back to the basics of survival and made a fire next to a rock to use installation. When the amount produced is hot enough, then they can connect to the router by using a smartphone.